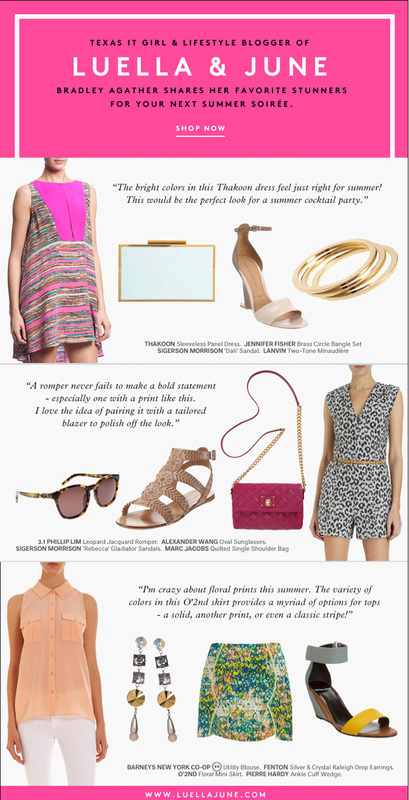 I’m so honored to be featured in Barneys’ latest newsletter. With summer right around the corner, the Barneys team asked me to style three of my favorite looks that would work for a summer soirée. There are so many amazing new online arrivals (not to mention, a brand new look for the site! ), that it was difficult to choose just three. You can check out all of my picks online. And I am dying for those Sigerson Morrison wedges – every single color they come in are gorgeous! Congrats on the feature! That's huge! Texas It girl- love it!! This is awesome and I love the looks you picked. Especially that romper- gorgeous! How exciting! The feature looks great! Congrats! yahoo! they chose the right girl to pick summer styles. xo. Wow, that's awesome Bradley! Congratulations 🙂 My favorite is the Thakoon dress. And I hope you've bought those Dali wedges by now 😉 They are too cute. Congrats! Your picks are amazing! I would wear them all! This is so exciting, Bradley! Your pics are perfect and what a great feature! Barneys is one of my go-to stores in Dallas.